Wedding attire is as diverse as weddings themselves. There are all types of styles, colors, and fabrics to choose from. In the last few years, gowns have been designed to incorporate just about every color. My advice to the bride-to-be would be to get your hands on some bridal magazines, books at the library, or search the internet for some ideas of what type of wedding attire you might like. Keep in mind that the gown you may like on the page may not be the one that will make you look radiant, so it may be wise to choose more than one style. This goes for the tux also. 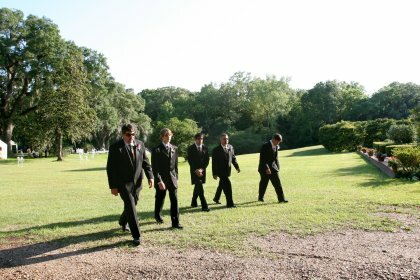 For instance, you may love the long tailed tux, but your groom is a short stocky guy. You would not want to have him in this tux, because it will only serve to make him look that much shorter. On the other hand, you wouldn't want to choose a gown in a heavy material if your wedding is in the middle of the summer. Get my drift? 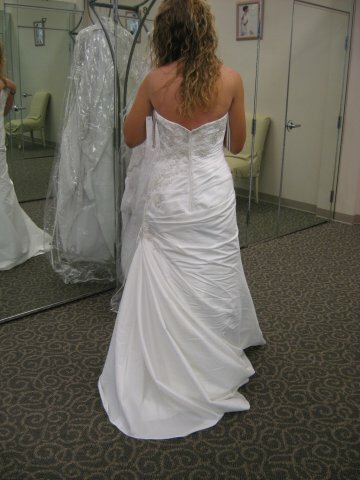 When you go shopping for your dress, be sure to try several different styles on. Be sure to take a trusted friend and your mother, if you have similar tastes in style. Be careful here. If your taste and their taste is completely different it could pose for a very frustrating shopping trip. But if your shopping mates share your taste in style, they can be invaluable in helping to choose the wedding gown that will make you gorgeous for all to behold. Of course you should have set your budget for wedding attire by now, and should remain in your price range when hunting out that perfect wedding gown. Many formal wear shops have packages for wedding tuxes that will save you money. You can save yourself money by searching out the shop that will give you a great deal. Remember to compare the same or very similar packages so that you know when you have found the one that is truly saving you dollar bills. There is a lot of lingo that the sales consultants will use that may not be familiar to you. Ask questions about anything you don't understand. Most of all, this should be a very exciting time for you. Have fun! Make your wedding your own. Choose your own elements and it is sure to be "Just What You Want".